A Server Node can be added in cluster any time. 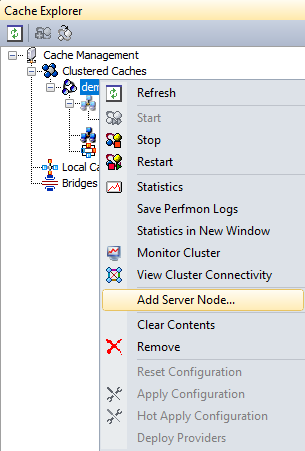 After adding a server node in a cluster, you need to start that node so that it can join the cluster. 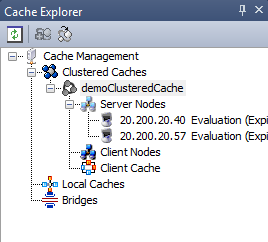 Right click on a cache name in Cache Explorer and select Add Server Node option. Add Node Wizard will open. Specify the server IP which you want to add in text box and click Finish. Added node will appear in Server Nodes list under this cache name. Add-Node cmdlet enables the users to add a new server node to the existing Clustered cache on specified server. This command adds a new server node '20.200.21.107' to a cache named demolusteredCache on existing server '20.200.20.38'. 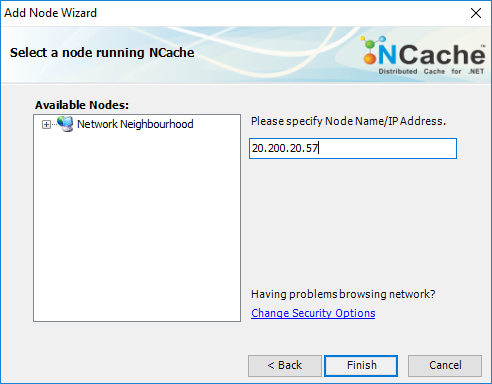 This command adds a new node 20.200.20.107 to the cache named demoClusteredCache existing on server node 20.200.20.38 which already exists using the port number 8251 since it is not using the default port. To add a server node to a cache cluster, add a new <server-node> tag within the <servers> tag in config.ncconf of EACH of your cache server. Repeat this step on all server nodes.